Have you ever wondered if it's possible? It is, and we have the board & specialty gear to make it happen! SUPing alongside a canoe is ideal because you can pack some of your gear in their boat and each can take turns enjoying paddling the different watercrafts. But, if it's just you, we have quality rental gear to get all your supplies packed, waterproofed and secured on your paddle board, as well as, backpack-able for portaging. This lightweight 30 Ibs board has a 250 Ibs capacity. This board will safely carry you and your full gear through rugged shoreline and windy waves. We use a 70 L dry bag backpack on the stern, a 40 L dry bag backpack on the bow, and you wear a 30 L dry bag backpack. This disperses the weight well for good board trim. Keep your center of gravity low by packing heavy items low and central on the board. The bag on your back is the only one you should go into during the day (map, sunscreen, camera, day's food, raincoat, fleece, water filter, water bladder, etc.). You must pack compact and lightweight for SUPing/portaging. More weight equals less stability and paddling difficulty. Too assist you further, we also offer a compact, lightweight solo bivy & tarp system. An extra long kayak paddle serves as your spare paddle. It will increase your speed, in case you want to keep up with your tandem canoe buddies. It gives you the versatility to paddle your board from a kneeling or seated position, granting tired muscles a break by utilizing different muscles. An Inflatable PFD is ideal so you can wear a 30 L backpack, preferably with a 2.5 L water bladder. You must be 16+ and a good swimmer to use a belt style inflatable PFD because after inflation you must pull the top portion of the bladder over your head and shoulders. Stand Up Paddle Boards are light at only 30 - 32 lbs. This small female is portaging a hardboard using our harness. We also rent inflatable multi-day boards. The "Straight" board has 8 embedded metal tie down rods in 1.5" x 1 1/4" holes with adjustable bungee cord. There is another on the bow and stern for your board leash and for transporting on a vehicle. There are two 1/4"-20 threaded brass inserts for mounting accessories on this board. A popular size for fishing rods, fish-finders, phones, tablets, cameras, cup holders or whatever you desire to screw to the deck of your SUP with a 1/4"-20 screw. It also fits Scotty fishing products. 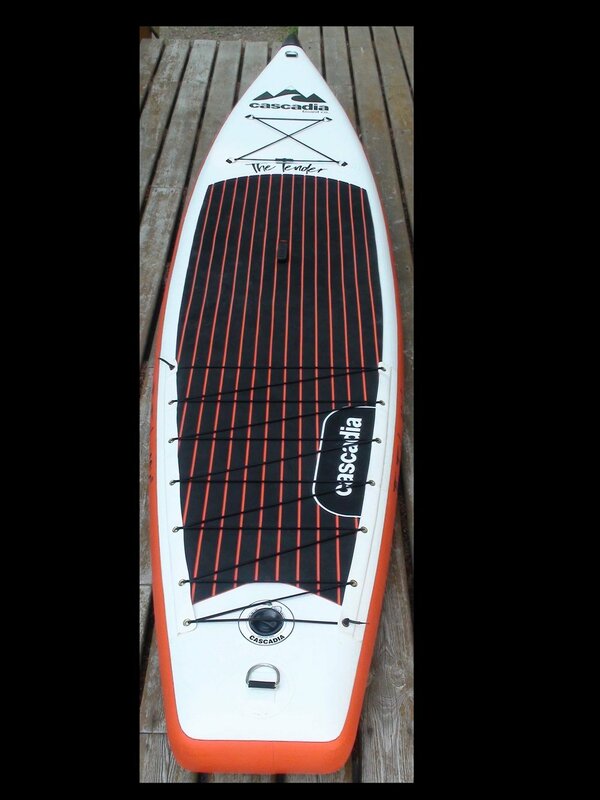 The Cascadia 12' 6" Tender Inflatable Stand Up Paddle Board for multi-day Stand Up Paddle Board adventures. Our newest edition to our multi-day Stand Up Paddle Boards. This inflatable only weights 32 Ibs and has a 200 Ibs capacity. I had a 2.5' lace strip installed up the sides to increase the cargo hold area significantly. With a narrow shape and upturned nose, this board was designed for handling long distances, tides, chop and wind.